Source reader Tim Adams of the local volunteer organization Transit People (they take kids on transit field trips… awesome!) 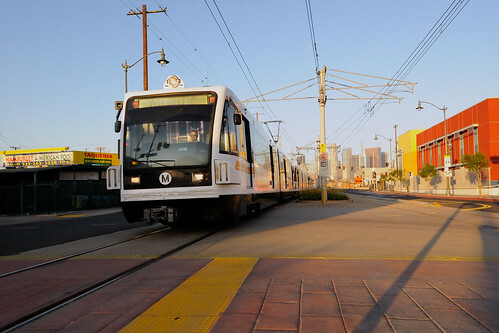 sent us some gorgeous shots of the Gold Line riding through East L.A. on its inaugural day. All photos were taken in the wee hours of the morning well before we were out snapping our shots. All captions are by Tim and he’s got other photos on the Transit People Flickr photostream. An out-of-service Gold Line train stationed at the Atlantic station, photographed shortly after 6:00 a.m. on Sunday morning, November 15 -- grand opening day for the Gold Line East Side Extension.